We have been back with the military this week, in Windsor and The Band of The Household Cavalry who are based at Cumbermere Barracks in a beautiful part of the town. 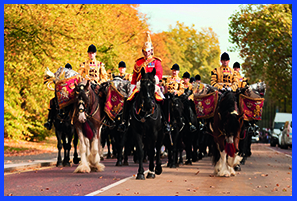 The Band was formed in September 2014 by the union of the two mounted bands; The Life Guards and The Blues & Royals. The band is the largest symphonic wind band in the British Army and famous for its mounted capability. They have recorded their first CD for over ten years and in addition to some traditional regimental music they include some fine instrumental aspects featuring the music of Philip Sparke. Perhaps the highlight of the project is the first wind band recording of Edward Gregson’s extended work ‘Variations on Laudate Dominum’, arranged by Rob Wiffin presently Professor of Conducting at the Royal Military School of Music at Kneller Hall. The CD is due for release in the early part of the summer and you can learn more about the Band here and on their Facebook page.